The year was 1991, and Craig Lambert had just taken out the Richmond best and fairest award. This is long before the current day glitz and glamour of club Best & Fariests, complete with live streaming on the club websites. 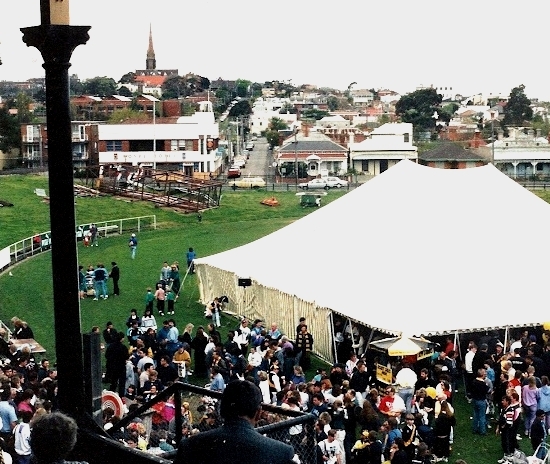 This was pretty much a sausage sizzle under a tent with 100 or so people around.That’s me on the left, Lamby in the middle and my sister Mezz on the right. Contrary to the lies I told my sister, that is not David Cloke in the background! So that’s me in my dorky early 90’s Richmond attire… I would’ve worn Tiger jocks had they been available. Note my sisters Trent Nicholls badge atop her hat, her favourite player at the time, while Flea Weightman’s badge is close to my heart. The following year saw me don Lamby’s number 4, and as I had a long sleeve jumper, this felt authentic. It was with sadness that another Tiger hero of mine left at the end of 1993, but I followed his career with interest, much as I did with Stuey Maxfield in Sydney. 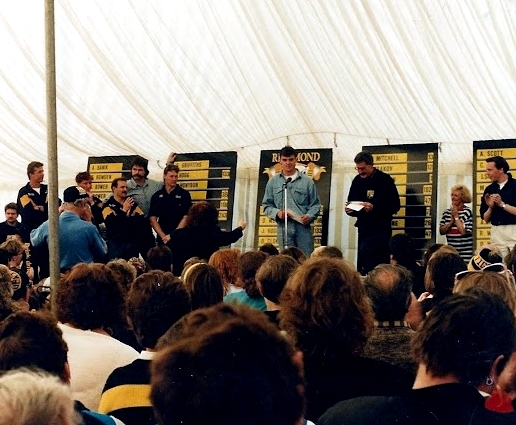 Best & Fairest 1991 style…Nev Crowe presents a double-denimed Scott Turner as Cameron Schwabb stands extreme left. Le far left players are Jeff Hogg, Lamby, Flea Weightman, old man Cloke and I think Craid Smith. 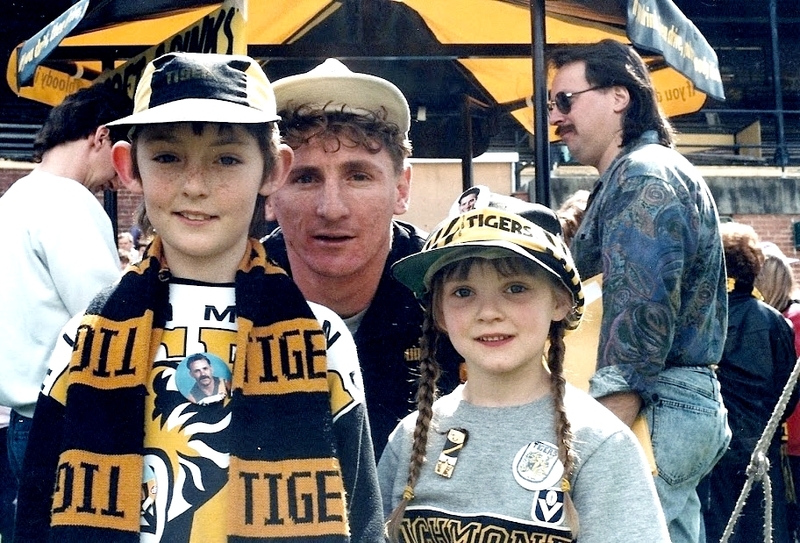 This entry was posted in Boots Happy Snaps and tagged 1991, afl, best & fairest, Craig Lambert, David Cloke, Footy, Punt Road Oval, Richmond, Tigers by theholyboot. Bookmark the permalink. WOW!!! how times have changed.